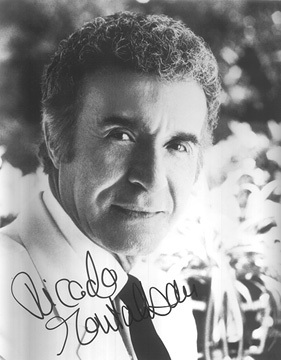 Ricardo Montalban, best known as Fantasy Island's Mr Roarke, was originally a song-and-dance man in both Mexican and American movie musicals. After that genre faded he became a character actor, often relegated to ethnic roles. In Sayonara with Marlon Brando Montalban played Japanese, he won an Emmy playing a Sioux on the mini-series How the West was Won, and he was also sometimes cast as Arabs or Greeks. Usually, though, he played the "Latin lover", eventually breaking stereotype-casting to become known for his acting ability alone. Montalban was born and raised in Mexico, and came to America as a high school boy, speaking not a word of English. With intense study extending into the evening every night, he was proficient enough in English by his senior year at Fairfax High School in Los Angeles to play the lead in the school's production of Tovarich. He wanted to be an actor, but the American stage and cinema were uninterested in his talents, and instead Montalban returned to Mexico, where he found character roles and eventually became a leading man. His best Spanish-language movies include La Fuga (The Flight), where Montalban played a Frenchman, and Nosotros (We), where he sang and danced. Almost a year after Nosotros was released in Mexico, an American screening of the film caught the eye of talent scouts at Metro-Goldwyn-Mayer, where Montalban was offered a contract. In his first role after returning to America, Montalban danced with Cyd Charisse in Fiesta, and he had a featured role in Battleground, a retelling of the Battle of the Bulge with Van Johnson and James Whitmore. By the late 1940s, Montalban was Hollywood's most famous Hispanic face, and behind the scenes he was an outspoken role model for other Latinos. Desi Arnaz reportedly selected his I Love Lucy character's name -- Ricky Ricardo -- as a tribute to Montalban. He married Georgiana Young, the youngest half-sister of actress Loretta Young, who gave Montalban frequent roles on her anthology series, Letter to Loretta. He was a frequent guest star on TV from the 1950s through the '90s, with repeated appearances on the long-running western The Virginian with Doug McClure and the medical drama Dr Kildare with Richard Chamberlain. Of course, he came to American stardom as Mr Roarke, the white-suited, mysterious but suave fulfiller of wishes on Fantasy Island from 1977-84. Montalban was also the longtime celebrity spokesman for Chrysler, and often lampooned for his almost sensual exuberance over the "fine Corinthian leather" covering the seats in selected models. Science fiction aficionados remember Montalban for a single episode of the original Star Trek, where he played the space cult guru Khan Noonien Singh, and for reprising the villainous character a decade and a half later in Star Trek II: The Wrath of Khan. In that film, Montalban's character trapped Captain Kirk beneath the surface of a dead planet and memorably taunted him, until William Shatner looked toward the ceiling, grimaced grotesquely and shouted his most parodied Shatneresque line, "Khan! Khan!" Montalban's 1951 western Across the Wide Missouri with Clark Gable was one of the few Hollywood westerns of the golden era that portrayed Native Americans as civilized people, not savages (Montalban played a Blackfoot). In filming, though, Montalban was reportedly thrown off a horse, knocked out, and walked on by another horse, leaving him with a spinal injury that troubled him for the rest of his life and grew more painful as he aged. In 1993 he underwent surgery, but it only made the pain worse. Montalban continued to work, usually delivering his lines from a wheelchair. Among his last roles, he played Grandfather Cortex in the Spy Kids films, and provided the voices for Se�or Senior Sr. on Disney's Kim Possible and the Council Chairman in the big-screen cartoon The Ant Bully. Montalban was the founder of Nosotros, a group that promotes Hispanic involvement in American moviemaking. His Ricardo Montalban Foundation restored and re-opened a Beaux Arts theater in Hollywood which had been a stage for radio dramas as the CBS Radio Playhouse, then a movie palace and eventually a playhouse called the Doolittle. It is now the Ricardo Montalban Theater, and houses the Nosotros American Latino Film Festival. At the theater's grand re-opening in 2004, Montalban spoke from his wheelchair. "Mexico is my mother," he said, "and the United States is the best friend I will ever have. I dream of the day when my mother will say, Ricardo, you have chosen a wonderful friend. And the day when the friend will say, Ricardo, you have a sensational mother." Montalban's brother was actor Carlos Montalban, whose career as a character actor spanned the decades from 1930s American-made but Spanish-language talkies to his last feature film, playing the Latin American General in Woody Allen's 1971 comedy Bananas. In TV commercials in the late 1960s and early '70s, Carlos Montalban played the persnickety white-hatted "El Exigente" ("the demanding one") who purchased only the finest Colombian coffee beans for Savarin Coffee.